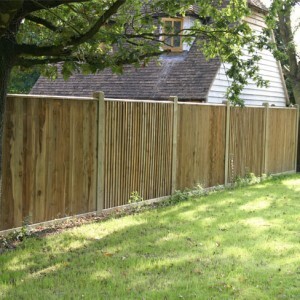 We are Specialists in installing wooden fencing. Timber is without doubt one of the most popular fencing materials used today whether the finish is natural wood, painted or stained in various colours. 95% of the timber we use is ‘home grown’ and from an FSC (Forestry Stewardship Council) source. The vast majority is Redwood and pressure treated, with Tanalith ‘E’ preservative, to a full class 4 specification. This gives the fencing a considerable longer life expectancy than, for example, using a lesser quality timber like Spruce. Even our lap panels are Tanalith ‘E’ pressure treated. The result is that you not only get a fence that is strong and looks good, but stays strong and looking good for many years to come. 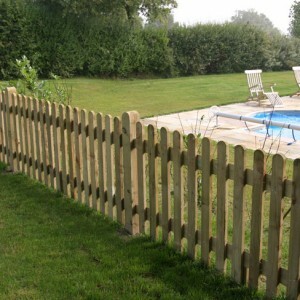 We hold extensive stocks and can supply most types of fence very quickly. 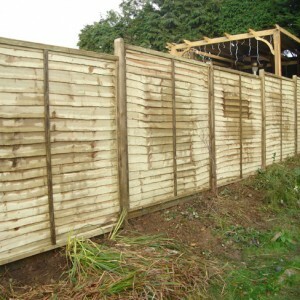 Fence Panels can transform the look and feel of a garden without spending a fortune! We have a large range of panels to suit every garden; choose from the standard Waney Edge, Interwoven or Closeboard Panels, or choose to upgrade to our more premium panels available in tongue & groove cladding, Venetian style vision panels or Hit & Miss clad. Closeboard Fencing is one of our most popular types of timber fencing, providing privacy & security with it’s solid boarded effect. Constructed using loose components allowing us to tailor to your area, choose from combinations of various options with counter rail & capping, trellis and specially machined post tops. Standard bay widths of 1.8m, 2.4m and 3.0m. Non standard heights & bay widths can be accommodated for. Available in all timber or timber with concrete options. Palisade Fencing, often known as Picket Fencing, is available in Round, Pointed or Flat top palisade options with posts machined to match. ‘Sawn’ finish is suitable for most applications and would be installed on triangular arris rails. We can also offer an upgrade to ‘Prepared’ finish which is more suited to public applications such as Schools or Playgrounds. Bespoke and non standard heights can be accommodated. Post & Rail Fencing is a versatile option of fencing that can be used for both agricultural applications or to create a rustic boundary fence for more domestic settings. 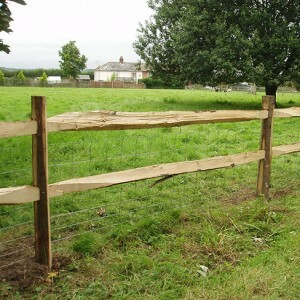 Often referred to as Livestock or Agricultural fencing. Choose from our hardwood Chestnut Post & Rail, softwood Nail on Rails or ‘scarfed’ rails with mortised posts and half round rails with half round posts. Choose from 2 rail or 3 rail options to suit your requirements. 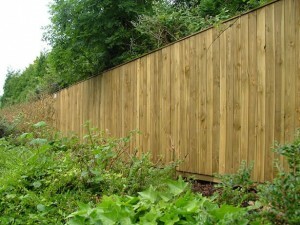 Acoustic fencing is used as a sound reflective barrier for reducing noise nuisance. This fencing has a low visual impact and can be used to reduce the impact of noise on homes and households, for schools, businesses to retail and transport. We can design and install an acoustic fencing solutions which will provide noise reduction and security. 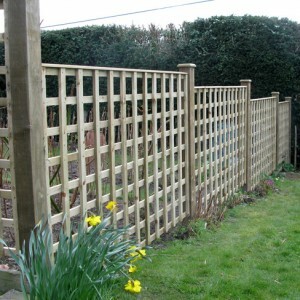 Trellis fencing can be used in a variety of applications in the garden; use to divide different areas, as support for the growing of your favourite plants, to hide or disguise unattractive necessities such as bins or oil tanks, or use on within your fencing for a combination of privacy with vision. Choose from standard square or diamond, in a range of heights, widths and shaped tops. Can be manufactured to non standard sizes & specification.